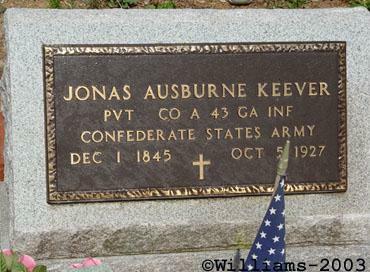 Jonas Ausburne Keever, son of James Keever and Mary Rebecca Jane Bradshaw, husband of Mary Baker. 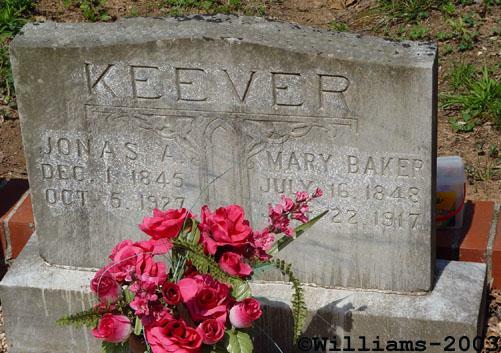 Mary Baker, daughter of Caleb Baker and Sophia Emma Fagans, wife of Jonas Ausburne Keever. 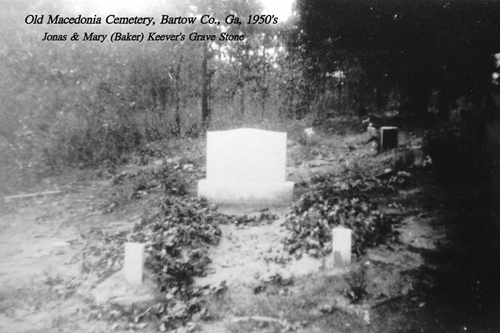 When Jonas was only three months old, his parents left Lincoln County, North Carolina with a wagon train and traveled to Bartow County, Georgia. 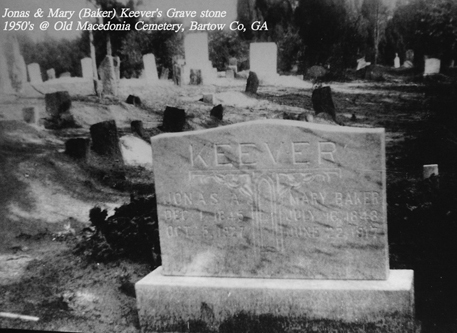 His father, James Keever, had a brother, Daniel, who was already living in Georgia. 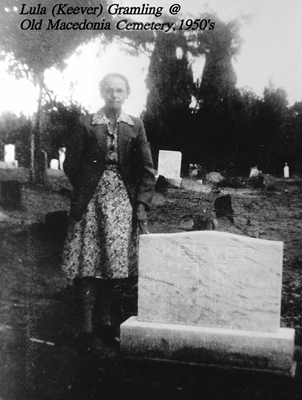 His mother's sister, Elizabeth Abernathy, and his mother's uncle, Larkin Bradshaw, traveled to Georgia at the same time. They settled north of Cartersville near the Etowah River not far from the Cherokee County line. Georgia Volunteers, Army of Tennessee. Jonas participated in the defense of Atlanta. After the fall of Atlanta, he took dysentery and was left sick in Columbus, Ga. He was on his way to rejoin the Army in North Carolina when the war ended, and surrendered at Greensboro, North Carolina. In October 1910, he applied for a Civil War Pension and made the following statement on his application: "I am a resident of Cherokee County, Georgia and my only income is a small crop. I own one cow worth $20.00, a wagon and buggy worth $25.00, two horses worth $175.00, household goods worth $50.00, and $70.00 cash." 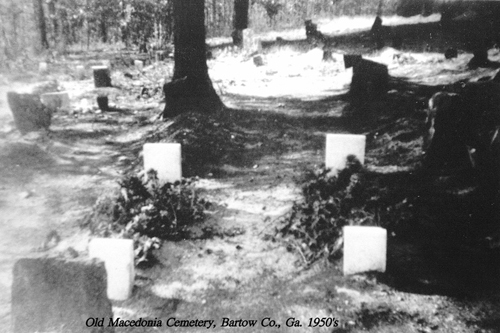 Jonas and Mary were member of the Macedonia Primitive Baptist Church. All that remains of this original church site is the cemetery. A new church building was erected in later years on the main highway between Cartersville and Canton. 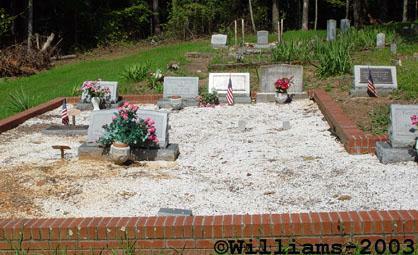 The cemetery and original church site are located in a remote wooded area on the shores of Lake Allatoona, on property now owned by the Corps of Engineers. made his home with his youngest daughter, Dellie Chambers. However, he visited often in the homes of the other two, Lenora Woodall and Edna Camp. Jonas lived in Dekalb Co, Alabama about nine years before his death of cancer. 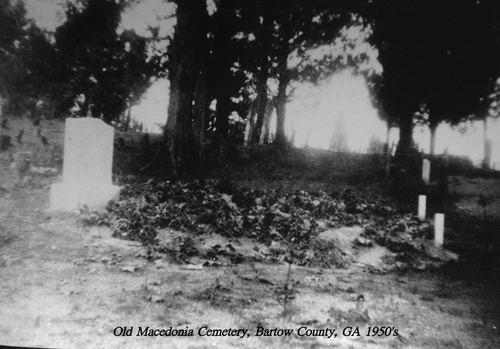 At death, his body was taken back to be buried beside his wife at the old Macedonia Cemetery in Bartow, County. Thanks to Deena Hardin for the circa 1950s pictures.